I was hoping for calm waters for the 5 mile swim and it was. The water was around 65 degrees so I wore a wetsuit and neoprene cap to keep warm. Since the city took out the buoys, we measured the distance along the walkway with the GPS. I settled into a rhythm and after 3 miles I was falling behind the 36 minute per mile pace I was looking for. I was a minute per mile behind so I pushed hard on mile 4 and made up a minute. I felt good being able to push without feeling like I was going to fall apart. It might be from the altitude training. I was drinking a protein / electrolyte drink and eating gels every mile. I finished up around 3 hours and 5 minutes. I quickly changed in order to get warm and prepared for a long, long bike ride. The plan was to ride through the city west to Oak Park and pick up the bike path, follow that up to McHenry and then ride the roads to Ottawa Lake, Wisconsin. I was going to ride past the lake and circle around to make the mileage 200. This would take all night and I would need to get to the lake in time for the 50 mile trail race that would start at 5 a.m. the next morning. Riding through the city at rush hour and not completely sure of the best way made our progress slow. I met our sherpas early to switch glasses since it was cloudy and I needed my yellow lensed glasses for better visibility. Heading west took us through Garfield Park, a really seedy part of the city. Everyone there was either selling drugs, buying drugs or doing drugs, except for me in my bike clothes on my bike and a car following me with a video camera hanging out the window. Yeah, I got some weird looks. I made it to the bike path about an hour slower than expected and planned on meeting the crew about 20 miles further in St. Charles. The bike path was gravel which slowed me down but it was direct and I didn’t have to drive in traffic. I got to the rendezvous point fairly quick – too quick since my support crew wasn’t there yet. I called to let them know exactly where to find me and my phone was just about dead from using Google Maps to get through the city. When they arrived, I ate some real food, gave them my phone to charge and headed back to the trail. Our next meeting point would be close to our place in Lake in the Hills. Soon the path would change to pavement so I gave them an aggressive meeting time. I wanted them to be there when I arrived since it was getting cold out and stopping for long periods made me cold. I turned on my lights and charged up the path to get warm again. Pushing hard warmed me up but the fast speeds created more wind chill. I was cold either way. I got to Lake in the Hills around 8:30 and my crew was there ready to take care of me. What a crew! It’s not easy to take care of someone all day and all night. Our routine was to put a blanket on me to keep me warm, fill my water bottles and feed me. At this point I changed into my long riding pants and added a long sleeve shirt. It was barely enough to keep warm. Our next stop was the end of the bike path in McHenry. Off I went into the night and when I reached Crystal Lake, I came up on 2 police officers walking the path. They stopped me and asked what I was doing on the path. I told them about my training and the race while accidentally shining my light in their eyes. They said the bike path was closed after dark but to go ahead and stay on it for the little bit I had left before switching to roads. I got to McHenry without any more run-ins and my crew was there with a really bright light. I saw it from a mile away and as I got closer it nearly blinded me. My glassed diffused the light and made it hard to see where I was going. when I got to Richmond they weren’t there. I started riding but then turned back. I found a guy who let me use his phone and called Judy. No answer. I left a message that I was heading to Lake Geneva and for them to catch up. I started riding again and made a couple of wrong turns. Highway B was Main street in one town so I missed that and had to back track. Another road was missing it’s sign so I ended up taking a different route than I told the girls. All the while I was kicking myself for not taking my phone at the last stop. I finally got to Lake Geneva around midnight and found my way to Starbucks. Not there. I asked another guy to use his phone and he obliged. This time Judy answered and they made their way to Starbucks. I got my phone from them and went through the routine again. I could see the weariness was creeping up on them. Judy had napped and Mary was going to try to get a nap in too. Amber’s an insomniac so she was good to keep driving throughout the night. I felt pretty good at this point but the longer I stopped, the harder it was to get going again. This stop was a half hour and it was hard to take the blanket off and get on the bike again. I calculated that I was about 115 miles into it. I forgot to start my Garmin in the city and my bike computer was acting up earlier in the ride but I knew from mapping out the route what the approximate mileage was. I knew I wouldn’t get in 200 miles so I thought it would be better to go straight to the race start at Ottawa Lake and if I wanted to add on at that point I could do that. So off we went to the lake. From here on out they followed me with their hazards on. This was really nice. I felt a sense of someone else out there with me instead of riding alone in the dark. And the extra light from their headlights was helping since my lights were starting to die out. At this point I started using Monster for the caffeine which helped me stay alert. They navigated using a GPS so I didn’t need to worry about that either. I could just concentrate on riding. That was great! The last 10 miles to the lake were really severe hills which normally I like but these just kept coming, one after another. We pulled into Ottawa Lake at 2:45 a.m. with around 150 miles. We checked out the race start and some volunteers were starting to set up already. I knew the girls needed some sleep so we looked for campsites to set up a tent but didn’t find any area that we could pitch a tent without getting a site. We discussed going back out but decided that it wasn’t worth heading out for another hour to hour and a half. I would need to start getting my running gear on and preparing for the run around 4:15. Plus my throat was getting sore like I was starting to get sick. So we ended up sleeping in the car for an hour. I woke up before the alarm at 4:15 and got my running gear bag, headed to the bathrooms and changed for the race. That hour of sleep totally re-energized me and my sore throat was gone. I came back to the car, locked up my bike and we all headed to the North Face Endurance Challenge 50 Mile Trail Race. A bunch of my friends were coming to do this race and I ran into a few of them on the way to pick up my packet. I was planning on running with Brandi since we thought we would be running the same pace. Robin and her told me they talked to Dean Karnazes about meeting me and he said yes. So, the race started and off we went in the dark at 5 a.m. The first 8 miles went good but my heart rate was kind of high so I stayed back a bit and Brandi pushed on. She was running about 10 to 20 seconds per mile faster and steadily pulled away. It was really nice to have the sun come up since I had been going through the night. It really brought me hope. I pretty much stayed at a 12:30 minute mile for the first half. My energy level was good and I stayed conscious of keeping my pace and heart rate low. I wanted to make sure I would finish the race. After the 28 mile aid station, I felt like I could push harder since I wasn’t getting tired. I told my crew (tri-sherpas) that I needed a Monster at the next aid station. So I began to give it some gas. I caught up to Robin and Brandi right before the 35 mile aid station. Robin was running with her so I drank my Monster and kept pushing to see what my body would do. A couple of weeks before I ran another 50 miler and was able to push the last half hard enough to negative split by almost an hour. I started to believe I could do that again since I only had 15 miles left. I hit a flat section and was pushing an 8 minute mile where I caught up to Mark and Annastasia. At this point I noticed that even though I was running hard, my heart rate was only getting into the 140’s. Every now and then it would go higher, but for the most part it stayed low. 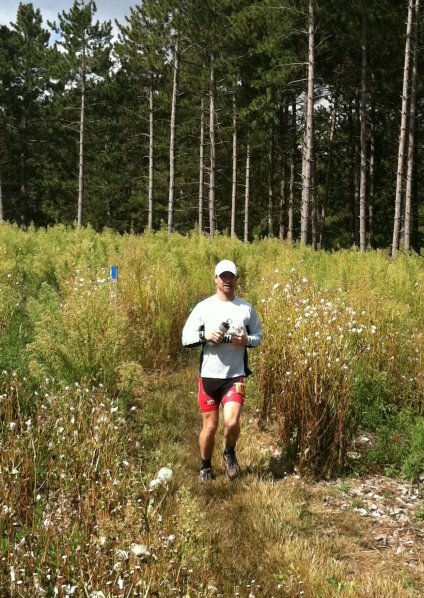 I only had 2 aid stations left so I kept my pace high and saw Mike and Eric a little while later. They said that Joy and Julie were a little further up. It took me probably another half hour to catch up to them and by this time there was only 1 aid station left. At that aid station they said there was about 4 miles left. I sped up to nearly a full sprint as the trail went downhill. I was running about a 7 to 7:30 minute mile when I passed a guy that started running with me. He asked if this was my first 50 and I said, “No, is this your first?” He said yes and mentioned that he would never run this fast if I hadn’t come along. With 1 mile left, there were some hills which were very tough to get through while sprinting and then it opened up to the road. The last half mile was on the road and I was still running in the low 7’s. I was surprised I could keep that pace and thought it was probably the result of being at high altitude for the last week. As I turned off the road to go towards the finish chute, the guy who was trailing me for the last few miles pushed past me and took the win. I crossed completely exhausted and was so happy the long effort was over. I really believed in the beginning that I could only finish at a slow pace because of the swim and bike throughout the night, but taking the risk of pushing the last 22 miles changed that and gave me the confidence that I can do well on little or no sleep. My finish time was 9:51 with a negative split of 1:09. After getting some food and sitting for a while, I was feeling better and got ready to interview with Dean Karnazes. When the camera turned on, he turned the tables and said he was going to interview me. That was really cool. He asked about the triple iron triathlon that this weekend was geared toward as a training session. He was saying it was crazy but the guy just ran across America this year! I think he may fall in the same crazy category. I fell asleep on the way home and got ready for a 3 a.m. wake up call to catch an early flight back to Colorado to finish my altitude training out there. This weekend ends not only the toughest 2 week training block, but the culmination of this year’s training for the ultra triathlon that will happen in 3 short weeks. This last week I swam around 13k, biked around 400 miles and ran about 78 miles in over 53 hours. Most of this was at an altitude of 9000′. Now I have to let go, rely on whatever training I’ve done and begin my 3 week taper.